The potato is a member of the Solanaceae family and was originally from the high mountains of South America. 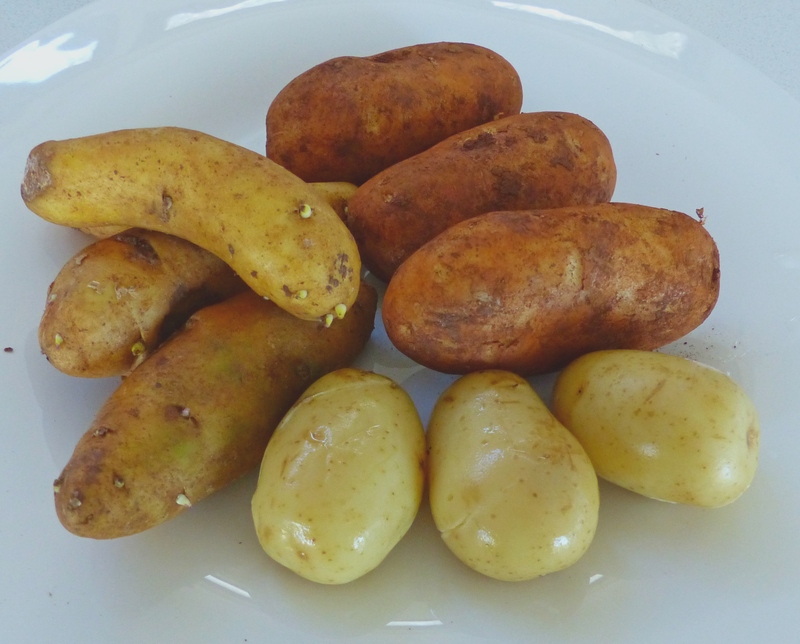 There are many varieties available with yellow-fleshed waxy potatoes being prized by chefs and gourmets. Examples of yellow-fleshed varieties are Kipfler which is great baked or boiled and unbeaten in salads. Spunta is a huge oblong potato and is great for chips. Desiree, Nicola and Dutch Cream are not so good for chips but delicious boiled or mashed. Kind Edward is unbeaten for roasts. Royal Blue makes a delicious mash. Pink Eye is ideal mashed or boiled as ‘new’ potatoes. One seed potato should yield around 10 potatoes. They generally do not do well in areas of extreme heat or frost. They grow the best in sunny areas. They prefer well-drained, fertile and friable (crumbly) soil with plenty of mulch to keep the soil moist. They enjoy the addition of potash and blood and bone to the soil. Ideally the soil should not have grown potatoes for 3 years prior. Start with certified disease-free potatoes to lessen the chance of disease. They are susceptible to an aphid-borne virus that causes lower yields in the next generations. Potatoes are a spring and autumn crop. Plant when soils are warm at least 15°C, from spring through to the end of summer in temperate zones. Ideally plant them in Australia from mid-August to mid-September and then again from mid-January to mid-February. Make a small burrow 10cm deep and cover with soil 30-40cm apart. Hill up the soil or heap mulch around them as they grow to exclude the light. They require heavy watering from the time the flowers form to harvesting time to help in the growth of the potatoes. Be careful as all parts of the potato plant are poisonous except the tubers which have no green tinge. If you intend to save the potatoes for seed then a great idea is to regularly spray them with seaweed brew to build up their aphid resistance. The tubers take around 4 months to reach maturity. Harvest new potatoes 1 month after flowering or wait until the plant dies down. In frost free areas cut the plants down and cover with straw to stop them resprouting. Leave in the ground for 2-3 weeks to harden the skin before storing. Keep in a cool, dry, dark and well-ventilated place to prevent from sprouting. Exposure to light causes potatoes to turn green, become bitter, indigestible and even poisonous with oxalic acid.